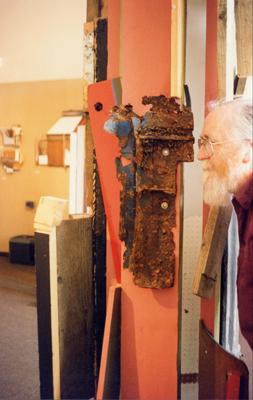 David Moore has an interest in the artwork of Islwyn Watkins dating from the early 1990s. As curator of Brecknock Museum and Art Gallery in Brecon he showed the artist's work on several occasions and at varying scales. For the purposes of research and study, David would like to hear from those who were involved in Islwyn's art-related activities or who might own work by him. Please contact him by post, telephone or email. 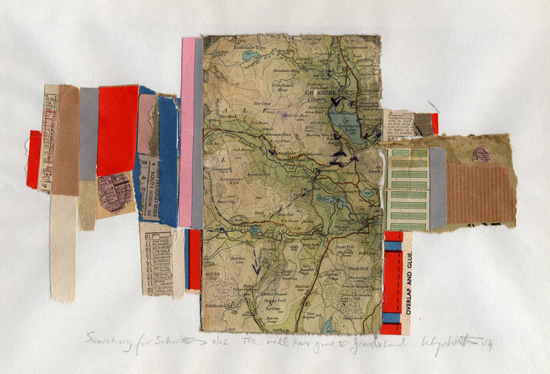 Islwyn, who died on 30 December 2018 aged eighty, was an outstanding maker of elegant and witty constructions and collages derived from found and used materials. He also ran a celebrated antique country pottery business in his adopted town, Knighton, on the Welsh borders. Lively and imaginative, he was passionate in his interests, a natural performer, stimulating and, often, mischievous in conversation. Born in Tonypandy, Rhondda, in 1938 Islwyn attended the local grammar school. He studied at Cardiff College of Art, 1954-59, travelling daily by train with fellow students. Although attracted by the work of St Ives artists, the greatest influence upon him was the work of German Dada sculptor and collagist Kurt Schwitters. 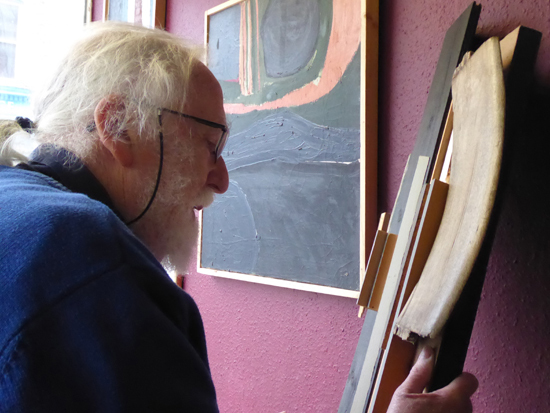 Islwyn taught art at Ravenscroft School, Barnet, 1959-64, studied lithography at Hornsey College of Art and became a life-long friend and collaborator with the anarchic and multi-talented Jeff Nuttall, the author of Bomb Culture. Both members of Group H, they participated, at this time of Cold War anxiety, in provocative happenings and performance art. Together with Bruce Lacey, John Latham and others, they created the sTigma, a notorious 1965 installation at Better Books in Charing Cross Road. * In 1965 Islwyn left for the United States, taking a masters degree at the University of Wisconsin, Madison, and partaking in other remarkable happenings. An inspiring lecturer at Birmingham's School of Art Education, 1967-78, Islwyn exhibited in 'Midland Art Now' at Birmingham's Ikon Gallery in 1976. Disillusioned with educational developments, he moved to Knighton in 1978 and involved himself in the Welsh art world, being appointed chair of both the Association of Artists and Designers in Wales and the Welsh Group. He exhibited regularly, including, to encourage a dialogue with art, in shops and cafes. Reprising his 1960s collaboration with Nuttall during the 2000 Brecon Jazz, they created Merz Jam, a giant Schwitters-inspired walk-through installation in which saxophonist Lol Coxhill performed. Islwyn's final exhibition, in 2018, was staged at the Old College, Aberystwyth. RealityStudio: A William S. Burroughs Community. 2. Islwyn Watkins: Constructions and Collages, a short illustrated account of the artist's work first published by Crooked Window in 2010, is now in its fourth 2018 edition. Click here to purchase a copy from the on-line shop. 3. I'r Goleuni: Rhoddion CCGC i Brifysgol De Cymru / Into the Light: CASW Gifts to the University of South Wales, Ffenestr Gam / Crooked Window, 2017, includes a discussion of Islwyn's 2005 construction Who's Afraid of Kasimir Malevich? 4. Y Grwp Cymrieg yn 70 / The Welsh Group at 70, a celebratory publication prepared by Crooked Window for the Welsh Group in 2018, includes a section on Islwyn as well as other references to his involvement in the group since 1959. Information about earlier publications may be found on the Welsh Group's website. 5. Islwyn's obituary in The Guardian was published on-line on 27 January 2019. The Guardian obituary. This was published with additional photographs in the newspaper on 18 March 2019.